C.L. Taylor is the Sunday Times bestselling author of six gripping stand-alone psychological thrillers: THE ACCIDENT, THE LIE, THE MISSING, THE ESCAPE, THE FEAR and SLEEP. Her books have sold in excess of a million copies, been number one on Amazon Kindle, Audible, Kobo, iBooks and Google Play and have been translated into over 25 languages. THE ESCAPE won the Dead Good Books ‘Hidden Depths’ award for the Most Unreliable Narrator and THE FEAR was shortlisted in the Hearst Big Book Awards ‘Pageturner’ category. She has also written a Young Adult thriller, THE TREATMENT, published by HarperCollins HQ and is currently writing her second. Cally Taylor was born in Worcester and spent her early years living in various army camps in the UK and Germany. She studied Psychology at the University of Northumbria and went on forge a career in instructional design and e-Learning before leaving to write full time in 2014. She started writing short stories in 2005 and was published widely in literary and women’s magazines. She also won several short story competitions. In 2009 and 2011 her romantic comedy novels (as Cally Taylor) were published by Orion and translated into fourteen languages. HEAVEN CAN WAIT was a bestseller in Hungary and China and HOME FOR CHRISTMAS was made into a feature film by JumpStart Productions. Whilst on maternity leave with her son Cally had an idea for a psychological thriller and turned to crime. Want to be the first to know when CL Taylor has a new book out? 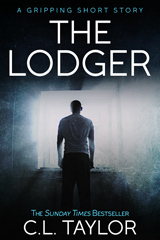 Join the FREE CL Taylor Book Club and receive THE LODGER, a gripping 9,000 word ebook for free. When people think I’ve published a book 😂. Looks like I need to read Sleep, looking forward to some Easter holiday reading. I hope you enjoy it! All the best, the other CL Taylor. I came across your books in a charity shop one day and omg! I read the 3 books that i purchased (The Accident, The Lie & The Escape) within just over a week. I am gripped with your novels. I immediately googled you and discovered your other novels. I was running around like a mad man on my lunch break from work to go purchase ‘Sleep’ and you’ve done it again. WOW! Hi Andy, I’m really chuffed that you rushed out to buy Sleep after discovering my other books and that you enjoyed them all! I really appreciate you taking the time to send me a message. Comments like yours spur me on to make the next book as good as I can! All the best, Cally.